I noted the first signs of abnormalities in December 2010 when coding a script that required me to use my left pinky finger a couple hundred times to hit the "a" key. In the end it started to buckle even though the keyboard was very sensitive and just a little bit of force was needed. In March 2011 I changed my office for a couple of months and immediately noticed how much easier it was to type with the new keyboard that had more sensitive keys and a wrist support. After that experience, I realized I needed a new keyboard in my regular office. During the spring of 2011, I noticed my left arm cramped when bending the wrist downwards, and that the left wrist buckled when lifting a six-pack with my palm down. 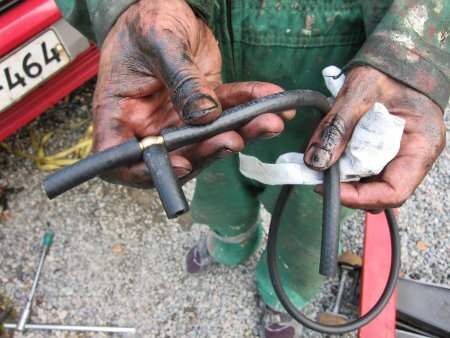 In May 2011 I changed the fuel lines on my wife's car and the engine on mine. When pulling the wires through the cramped routes and tightening nuts in awkward positions, I noticed my arms cramped. Thought it was my carpal tunnels acting up. In June/July 2011 we had our annual boat trip with my wife. Before the trip I thought a week away from the office would be good for the nerves in the left arm and brachial plexus. On the second-last day of the trip I hit my head to the edge of the hatch, and the last night I spent 16 hours in a bad position behind the steering wheel. The morning after we had returned, a constant violent twitching started in my both arms. Even though I still thought the twitching could be unrelated to the previous neurological oddities, and might have been caused by the hit to my head or the bending of the neck while sleeping behind the wheel, at that point I started to look for any signs that would hopefully point away from ALS. Soon after the twitching started, I realized there's a progressing malfunction in my left hand: it was very difficult to rotate a tennis ball with my fingers or a Post-it notebook on a desk. While the progressing clumsiness and twitching were enough to get me started on studying about ALS, I still maintained that the twitching and neurological problems could be two separate things - the former caused by excessive and prolonged stress and the latter by poor work ergonomics. I got an elbow and wrist support and started exercises meant for carpal tunnel syndrome and TOS. My logic was that if it is ALS, I have nothing to gain by seeing a neurologist; and if it's a mechanical issue, the splinting and exercises should take care of it. In September 2011, I changed the hydraulics return piping on my wife's car and realized I was unable to hold the pipe with my left hand while pushing the union inside it with the right one. In October, I realized my left wrist started to buckle when holding a plate and putting food on it with the right hand. There was a strange radiating pain between my left shoulder blade and the buckling wrist, which I hoped would point away from ALS. During December I tried Nordic walking and swimming hoping that they might help releasing the nerves if they would be compressed in my thoracic outlet region. In March 2012 it was time to spend a few weekends taking care of firewood for the next winter. I was able to use the chainsaw by splinting my left wrist, and thought the exercise might in general be good if the troubles indeed were caused by TOS. Collecting the wood went OK, although operation of the tractor's hydraulics were pretty clumsy. Around that time thenar atrophy became obvious in my left hand. In April, I got my engine project up and running. By that time it was obvious that the left hand was not going to get better and there was something wrong with the right wrist too, as it started to buckle when holding the power drill. In May 2012, I learned that my wife was pregnant. I needed to go to the annual physical examination in order to renew my radiation worker's licence. From there I was ordered to EMG because of my wrist, and the results showed widespread neurological damages in both upper limbs, too large to be explainable by any mechanical causes in spite of prolonged distal latencies in both arms. I was sent to my local public hospital for further examinations with a short description of the reason: "Motor neuron disease?" Lots of changes in a month. We had our annual boat trip (still managed to do most of the things with the single 50 % arm) and upon returning, the diagnostic process begun with an MRI on Jul 13. I was admitted to the clinic for a number of tests in the beginning of August. The tests included an extensive EMG, the results of which were summarized as "this is some kind of motor neuron disorder but it is so strictly limited to upper limbs that it does not look like ALS". Distal latencies in both upper limbs were markedly prolonged. Since I have spent most of my summers in a tick-rich region where Lyme disease is common, I asked for those tests as well. The results in both CNS and serum showed slight but definite (12 VE/ml; negative should be below 9 and 9-11 is considered borderline) increase in IgG antibodies, but this was told to be diagnostically insignificant. CSF proteins were slightly elevated, but no other anomalies were found. I spent the August and September weekends on my boat trailer project. The features include steerable wheels and a tilt. Welding went relatively well with the weakened right hand, but I had significant troubles working with the angle grinder and especially operating its pretty tight power switch. On Sep 9 I needed to take out a few trees from our garden. At that time I noticed I was unable to raise the chainsaw over my hip. It was a clear indication that my left arm had kept getting worse during the past six months although I had not noted it before. In early October I noticed it was almost impossible for me to sign papers as I could no more hold a pen. I also noticed that swimming was almost impossible as I could no longer move my hands past my head. My first visit to the Norsk Borreliose Senter Lyme disease clinic took place in September. Blood tests were taken and sent to Germany for analysis, and I received prescription for antibiotics: doxycycline 200 mg twice daily and oral azithromycin 500 mg once daily for three days, followed by three days' break. The protocol lasted for six weeks. My car developed a hydraulics leak and my wife's car was in need of a more thorough overhaul. With the baby due in January I decided it was time to give up with the BX only fleet and bought my wife a newer car. It was a bit tough for me to hold hands on the rather high steering wheel but I was nevertheless still able to drive myself whenever the car was free. On Dec 7 it was time for my second visit to the Norsk Borreliose Senter. I got a prescription for naturopathics but no antibiotics this time. Since my car was out of operation and my hands were too weak to do anything about it, I traveled to work by bus. During the entire fall I had walked a couple of miles on every lunchbreak and my legs had been OK with that. Now the cold weather seemed to make things worse: walking felt pretty stiff and I was afraid of my legs giving in when I stepped to the snow from the bus. I also fell a couple of times when the bus accelerated before I had made it to the seat. Operating the ticket machine became impossible and I needed to ask the driver for assistance. On Dec 18 I had my follow-up meeting with the doctors. This time I was met with a young trainee who asked if another more experienced doctor could be present. It took just 10 minutes from them to check my foot reflexes, confirm UMN symptoms and give an ALS diagnosis. They told me they're gonna arrange for me an appointment in the capital with the nation's top ALS specialist. They seemed to be in a hurry so they told me I could discuss Rilutek and other issues in the capital and sent me home to celebrate Christmas. I was able to have another Lyme blood sample taken and this time both IgG and IgM antibodies exceeded slightly the limit for positive (both at 12 VE/ml). On Jan 2, our baby girl was born two weeks ahead of time but completely healthy. I was still able to drive home, tank the car (with great difficulty), pack some clothes & seat for the newborn and drive back to the hospital. I noted that my walking had deteriorated badly in the two weeks following the diagnosis. I heard nothing from the supposed arrangement with the nation's top ALS specialist so I booked an appointment at his private practice on Feb 7. Huge disappointment. He spent the entire hour babbling about trivialities, gave no answer to my questions whether there are possibilities for a Finnish PALS to participate on any trials, and to my comment regarding the recently failed dexpramipexole trial he just said he thought he would have been the only person in Finland aware of that. I was somewhat astonished to learn that an average patient would know more about ongoing ALS research than the so called experts. Anyway, he confirmed beyond any doubt that what I have is sporadic ALS. I got a lecture on the benefits of riluzole and a warning not to believe what uninformed patiens say about the stuff on Internet forums. Walking to the doctor's practice was very difficult and my bag kept falling from my shoulder as I could not lift it up properly. After getting the diagnosis, I started to study. I bought Kindle books on neurology, neural sciences, immunology, biochemistry etc. and spent the evenings learning about stuff I initially knew next to nothing about. Loss of the use of hands forced me to change my way of learning - instead of sitting in front of a large drawing board I needed to start making the pictures in my head. I had the feeling I was close to getting a big picture of what ALS is all about but could not quite fit the pieces inside my head. I kept working, and with my wife at home with the baby I was free to use the car. Driving went OK but I had increasing problems turning the keys so it was quite a struggle to start the engine. A couple of times when I left the office and got on the road, bystanders called the police to stop me for a breathalyzer test because they had apparently seen me walk funny over the street and stepping in my car.